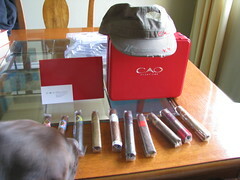 I Got my CAO Cigars Today for Wearing a Santa Hat! Posted byTravis Lindsay	 January 5, 2009 1 Comment on I Got my CAO Cigars Today for Wearing a Santa Hat! That’s right. On Christmas Eve I decided to put on a Santa hat along with beard in order to win a CAO Champions Sampler. I think it was worth it because I won ten cigars from CAO that were rated 90+ by Cigar Aficionado and/or were a top pick from another publication (Robb Report and European Cigar Cult Journal). I’ve smoked some of these cigars in the past I can personally attest to the quality of these cigars. What follows are some of the pictures I took to get this great prize and some pictures of the prize (just to show off). I would also like to thank CAO’s Director of Lifestyle Marketing Jon Huber for putting on this little contest. 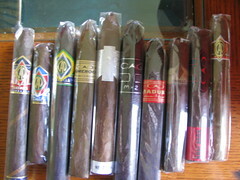 Follow him on Twitter @caocigars so you can have a chance to win a prize from CAO. 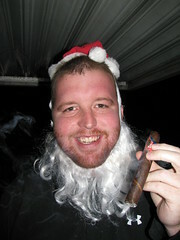 Travis is smoking a CAO America with a Santa hat and beard in order to win a cigar sampler from CAO. Travis won! My dog, Rommel, is looking at my prize winnings from CAO Cigars. I think he wants to try some out. Here are the ten cigars that make up the CAO Champions Sampler: Vision, Cameroon, Brazilia, Italia, America, Criollo, Gold, The Sopranos Edition, Maduro, Mx2.